This baked powder features a fiery mosaic of colours that provides the perfect natural colour for cheeks and face. Each tile is hand-mixed with a unique design. 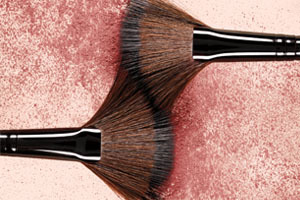 For a hint of natural colour, apply powder to cheeks using the Bronzer Brush. Add a light dusting to nose, forehead and chin for additional warmth. Cyclopentasiloxane, Aqua/Water/Eau, Phenyl Trimethicone, Ethylhexyl Palmitate, Glycerin, Butylene Glycol, Peg-12 Dimethicone Crosspolymer, Shea Butter Ethyl Esters, Silica Dimethicone Silylate, Lauryl Peg-9 Polydimethylsiloxyethyl Dimethicone, Mica, Dimethicone, Tapioca Starch, Isononyl Isononanoate, Polysilicone-11, Magnesium Sulfate, Caprylyl Glycol, Diisopropyl Dimer Dilinoleate, Ethylhexyl Hydroxystearate, Dimethicone/Peg-10/15 Crosspolymer, Trihydroxystearin, C30-45 Alkyl Cetearyl Dimethicone Crosspolymer, Caprylohydroxamic Acid, Betaine, Aluminum Dimyristate, Triethoxycaprylylsilane, Polymethylsilsesquioxane, Disodium Stearoyl Glutamate, Potassium Sorbate, Glyceryl Acrylate/Acrylic Acid Copolymer, Tremella Fuciformis Sporocarp Extract, Sodium Hyaluronate, Serica/Silk/Soie, Phenoxyethanol, Camellia Sinensis Leaf Extract, Cyclopia Intermedia Leaf Extract. May Contain/Peut Contenir/(+/-): Ci 77891 (Titanium Dioxide), Ci 77491, Ci 77492, Ci 77499 (Iron Oxides). Ingredients Cyclopentasiloxane, Aqua/Water/Eau, Phenyl Trimethicone, Ethylhexyl Palmitate, Glycerin, Butylene Glycol, Peg-12 Dimethicone Crosspolymer, Shea Butter Ethyl Esters, Silica Dimethicone Silylate, Lauryl Peg-9 Polydimethylsiloxyethyl Dimethicone, Mica, Dimethicone, Tapioca Starch, Isononyl Isononanoate, Polysilicone-11, Magnesium Sulfate, Caprylyl Glycol, Diisopropyl Dimer Dilinoleate, Ethylhexyl Hydroxystearate, Dimethicone/Peg-10/15 Crosspolymer, Trihydroxystearin, C30-45 Alkyl Cetearyl Dimethicone Crosspolymer, Caprylohydroxamic Acid, Betaine, Aluminum Dimyristate, Triethoxycaprylylsilane, Polymethylsilsesquioxane, Disodium Stearoyl Glutamate, Potassium Sorbate, Glyceryl Acrylate/Acrylic Acid Copolymer, Tremella Fuciformis Sporocarp Extract, Sodium Hyaluronate, Serica/Silk/Soie, Phenoxyethanol, Camellia Sinensis Leaf Extract, Cyclopia Intermedia Leaf Extract. May Contain/Peut Contenir/(+/-): Ci 77891 (Titanium Dioxide), Ci 77491, Ci 77492, Ci 77499 (Iron Oxides).